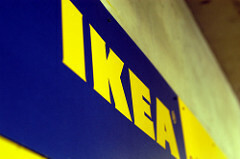 Flatpack furniture giant Ikea has announced plans to move into the property market. The firm has reportedly spent £25 million on a plot of land near the London Olympic Park. The new 26-acre suburb, called Strand East in Stratford, East London, will include over a thousand homes, a 350 bedroom hotel and 480,000 sq. ft. of office space. When the new homes are built, if you plan on buying one and moving the family in make sure you use Robinsons International’s expert home removals services. The development is located alongside a canal and will include a floating cocktail bar and boat taxi service which has led it to being dubbed a ‘mini Venice’. A planning application to build the new site is due to be submitted in early 2012. LandProp, part of the Inter Ikea Group which owns the intellectual assets of the furniture chain, is responsible for the development. The company already operates in Latvia, Poland, Lithuania and Holland but this is the first major British expansion. There have been numerous witty puns circulating the net with regards to the news of Ikea creating homes and ‘losing the manuals’. But if you are contemplating buying a home in the capital that is brand new with modern heating systems etc., you may want to wait until the site is complete. And when it is finally finished, use London-based Robinsons for your removals. We are an award-winning UK and international movers who provide quality home, commercial and office removals. So whether you are relocating to a new family home, or moving your business into a new office space, get in touch today. Image Courtesy of Ian Muttoo and reused under the terms of the Creative Commons Licence.